Get off the skipper’s back! That’s my message to a number of so-called Saints’ fans who seemed to take pleasure when Jon Wilkin was substituted during Friday night’s 40-16 victory over Huddersfield Giants at the Totally Wicked Stadium. Wilko, who will be 33 in November, is in the twilight of his trophy-laden career but as one of the club’s most experienced players still has a major role to play. OK, he will have had better nights than Friday, but the lad has shed, blood, sweat and tears and put his body on the line week-in and week-out since signing from Hull KR in September 2002 and deserves more respect. What makes it more galling is that the outburst came during a match which Saints had to win to keep alive their play-off hopes and needed the full support of almost all of the 9,000-strong crowd. 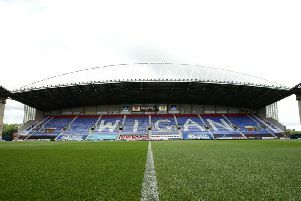 The Totally Wicked Stadium resembled a kindergarten after the curtain came down on Saints’ final home match of the season against Huddersfield Giants. Emphasising the family nature of the club, players cuddled their children on the playing pitch and also chatted to the fans in the crowd with eight day old Atticus John Walmsley - the son of prop forward Alex Walmsley - making his ‘debut’. Saints stars of yesteryear were on parade at the Totally Wicked Stadium on Friday night and they were joined by 19-year-old Kiel van Vollenhoven - the grandson of club legend Tom van Vollenhoven. Kiel - a right-handed batsman and spin bowler - is hoping to find a county cricket club in this country and is currently playing with the MCC. then he won’t go far wrong. Tom played for Saints between 1957 and 1968, scoring a staggering 392 tries in 409 appearances.